The mission of the Performing Arts area at Killara Primary School is to ensure that all students are dedicated, committed and passionate about all facets of performing arts. Our students will participate in every experience offered to them, with drive and determination, encouraging all students to reach their full potential, achieving outstanding results and more importantly, preparing them for the future both academically and allowing them to pursue performing arts in whatever form they are most interested in for the rest of their lives. During Performing Art sessions, students experience a variety of performing art elements including, dance, drama, music, (including instrumental music), film, animation and puppetry, to produce work that expresses themselves and their world. Students are encouraged to take risks in each session trying new things and to use their imaginations to create original and innovative pieces and performances. The students are encouraged to perform as often as possible whether in front of the class or a larger audience; this builds confidence and a feeling of achievement and success. Our School has been working towards becoming a Musical Futures Champion School and hopefully by later this year our status will be complete. Our school will be among the few Primary School's to have gained this status throughout Victoria. In Prep the students are encouraged to experience as many facets of performing arts as possible including playing percussion instruments, puppetry, dance and song. This term they will be learning to sing the National Anthem and the Killara School Song. They will also be introduced to choreography by learning party dances like the Maccarena, Chicken Dance, along with several others. In Year 1/ 2 the students are encouraged to continue building upon the knowledge and skills learnt in the previous year. They begin to develop an understanding of beat and rhythm through dance and instrumental music; they learn to express their feelings through drama and experience puppetry and performing. This term the students will be reviewing the National Anthem and the Killar School Song. They will be further developing their understanding of beat, rhythm patterns and the connections between music and dance, by playing tuned and untuned instruments. In Year 3/ 4 the students are being encouraged to explore the world of popular music. They will build on knowledge and skills learnt in previous years and develop new skills in an exciting and fun way. This term students will review the National Anthem and the Killara School Song. They will work together by creating a band and learning to play instruments, songs and developing an understanding of what it is like to work together towards a common goal. In Year 5/ 6 the students are being encouraged to further extend their knowledge and skills and develop new skills through investigation, analysis, observation, experimentation and teamwork. They will dance, do drama, learn music, sing, perform for an audience and create a short film. This term the students will review the National Anthem and the Killara School Song. They will experiment with composing their own songs on whatever instrument they feel most comfortable. They will work in small groups, compsoing both the music and the lyrics. The School Choir will begin the second week of Term 1 as the students will have a tight schedule, working towards the Battle of the School Choirs at the Sunfest Music Festival on March 14th. They will be rehearsing 2 lunchtimes a week. This is a big commitment, but one that the students find very rewarding. This Year Killara Primary School turned 21 years old. In celebration Killara's entire student population performed a three show concert for a total audience of over 800 people. ALong with the concert the students presented art work in Killara's first Art Exhibition. The entire event was a hugh success. The students were bussing for days afterwards and the entire community had a fantastic time. The teachers ansd staff were extremely proud of the students and their efforts on the day. 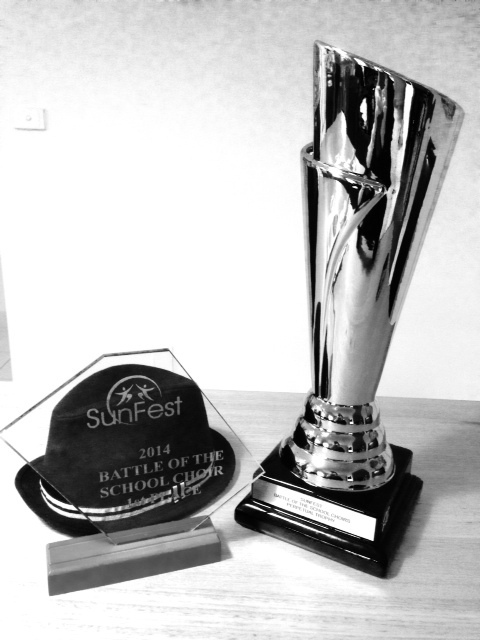 Our School Choir competed at the Battle of the School Choirs at Sunfest on Saturday the 15th of March 2014. They performed 2 songs; a Michael Jackson Medley and the Song Happy. The students were very excited and had so much fun on the day. All their hard work paid off as they won the competition making them the 2014 Battle fo the School Choirs Champions.